Great list Christine – half of me is saying ‘How could I have missed out…’ while the other half is making notes of the ones that are new to me. I like the sound of the two acting books. I made a deliberate decision to leave Henrietta to you – she probably should be on my list, but as you introduced me to her, you get to claim her! This had been such a lot of fun. Thanks for leaving me Henrietta! Incidentally, though I thought of Lucky Jim, I have never felt the same about it since I learned that Margaret is thought to be based on one of my tutors at Leicester, Monica Jones. It just seemed so mean. Thank you for commenting. Yes, Woody Allen is very funny, I agree. I had forgotten that. Glad you too like Wodehouse. So many of my favourites there! Ian Carmichael is one of my favourite narrators. His recordings of the Dorothy L Sayers novels are wonderful, I hear his voice when I read the books. He also recorded Three men in a boat, another favourite. I also love Mitford, Durrell (which I’ve only just read), Dennys &, of course, Sue’s novels. The theatrical memoirs sound great, I must investigate those. Always lovely to hear from you, Lynn, and to know we have such a lot of literary tastes in common. I keep thinking of other writers I could have listed,such as Barbara Pymm. She is not usually laugh-out-loud funny, but she has such a dry, sly wit. Very nice to hear this. Yes, it is a classic, isn’t it? 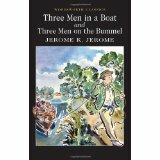 I’m not sure that I’ve read ‘Three Men on the Bummell.’ I must have a look. I liked your list so much. Bill Bryson’s book is a wonderful social history of America in the 1950s as well as being very funny. I haven’t read Moira’s post yet and she may have included this, but I think my favourite comic novel is Diary of a Nobody which I love with a fierce passion. Thank you, Sue, I am so pleased that you liked the list. Yes, Diary of a Nobody is wonderful and I thought of including it. What a fantastic list! I’m getting the two theatre books immediately. My vote for funniest Wodehouse is Leave it to Psmith, although like all other Wodehouse addicts, I could not tell you why. For more laughs, American style: Betty Macdonald’s The Egg and I, my candidate for the funniest book ever written in English. Shirley Jackson’s (yes, of “The Lottery” fame) autobiographical tales of raising four children, Life Among the Savages and Raising Demons. Jane Trahey’s The Trouble with Angels, an autobiographical story of adventures at a Catholic boarding school in the 1940’s or 50’s. James Thurber’s wonderful tall tales of his family and his own bumbling youth. I read them in A Thurber Carnival, but they’re kicking around in many anthologies. –Just thought I’d add a few suggestions for everyone’s Christmas list! Thank you! So glad you like the list. Some additions to my own reading list here. I did read Betty MacDonald’s The Plague and I years ago, and will try The Egg and I. Also the Shirley Jacksons and Jane Trahey.